Chief Justice Roberts falls ill. I don’t even want to browse the lefty blogosphere in light of this incident involving the Chief Justice. I can only surmise that I would need to take another shower. Long time talk show host Tom Snyder passed away Sunday evening at the age of 71. To be honest, I wasn’t a big fan of Snyder himself. However, no one could deny the power-packed guests Snyder could book on his late night shows. John Lennon, Charles Manson, cast members of Star Trek, just to name a few. For me, Snyder’s show served the ultimate noble purpose when he offered a venue for Weird Al Yankovic’s television debut. Al, along with band mate Jon “Bermuda” Schwartz, appeared on Snyder’s Tomorrow Show in 1981. One of the first songs Yankovic ever parodied was Queen’s Another One Bites the Dust. Here now is Weird Al Yankovic performing one of his first hits on said TV debut, Another One Rides the Bus. Q: What do you call a bunch of liberals locked in a basement? Yes, I know that’s a slight variation of an old joke. But it seems oh so appropriate given their shenanigans over the past couple of months. As we know, libs are abysmal failures at talk radio. When it comes to competing in the marketplace of ideas, liberals will always be defeated since the American people don’t care to hear their country being run into the ground. So instead of toning down the shrill and vile rhetoric, the libs stick to their motto of having even more government intervention. This time it’s the futile efforts to resurrect the undead that is lib talk radio by reinstituting the Fairness Doctrine. Thankfully that idea, like Air America itself, is all but dead. The Federal Communications Commission has no intention of reinstating the Fairness Doctrine imposing a requirement of balanced coverage of issues on public airwaves, FCC Chairman Kevin Martin said. I feel like a kid on Summer vacation! Oh, don’t get me wrong. Since being let go from my job after last Wednesday, I have stayed busy searching for gainful employment. But the search doesn’t typically begin before 9:30 am. Thursday, July 19: Woke up at about 9:00 am, due to the fact I didn’t get home until after Midnight (Traffic was awful leaving the Twins game Wednesday evening). My awesome gal made pancakes for breakfast. We then hung around the house until about Noon when we went to visit my wife’s parents in Western Wisconsin. My in-laws grilled the most phenomenal steaks I have had in quite sometime in addition to serving the most exquisite corn on the cob. Hung out there until about 8:30 pm and then headed home. Friday, July 20: Got up early, around 9:15 I guess. Bacon and eggs for breakfast. After breakfast, my gal and I went for a long 10-mile bike ride. Didn’t do much else the rest of the day. I think we may have gone to Applebee’s for dinner later on but that was about it. Monday, July 23: Slept in until about 9:45 due to being up until 4:00 a.m. watching Goodfellas on AMC. Again, pancakes for breakfast. My brother called me at 11:30 asking me to take my mom to the doctor since he had to borrow her car. I dropped off mom at her doctor’s office in Woodbury in time for her 1:00 appointment. I hung out at the local Northwestern book store until mom was done at 2:30. Mom then treated me to lunch at Don Pablo’s Mexican restaurant. In waiting for rush hour traffic to die down, I headed home around 6:00. I then went for a 45-minute bike ride from 7:30 until 8:15. Tuesday, July 24: I actually got up at 7:30 a.m. to get ready for a 9:00 appointment in downtown Minneapolis. I was home by 10:15. At 10:45 I talked to a recruiter guy whom I have been working with for a month or so. He had some job prospects he wanted to run by me. At 11:30, I had a phone interview with a Maple Grove company. Once that was done, my gal had grilled burgers and corn on the cob waiting for me. At 1:00, I decided to take a one hour nap (since I was up soooo early) before going to work out at the health club. I then worked out from 2:30 until 3:30. In the continuation of spoiling me rotten (as well as fattening me up) my gal brought home some pizza from Old Chicago restaurant after visiting with some of her friends there. We then watched a couple of DVDs the rest of the evening before turning in for the night. I know this will all end soon enough. But I have to say I am certainly enjoying it while it lasts!!! ….that you had to stand up to catch your breath? Well, the following video made by my good buddy Greg could be placed in such a category. Sports Einstein of the week: Tim Donaghy. Given that this bit is aimed toward pointing out stupidity amongst sports figures or their lack of good judgment, this one was a no-brainer. The FBI is investigating allegations that veteran NBA referee Tim Donaghy bet on basketball games over the past two seasons, including ones in which he officiated. It was a rare good week for President Bush in what has been overall a rather tumultuous second term. -The economy continues to hum along, with the Dow Jones industrial average breaking 14,000 for the first time. -One of the most fraudulent and overblown stories in political history, the Valerie Plame “leak case”, has come to a merciful and long overdue end. A judge tossed Plame’s suit, which accused Bush administration officials of leaking her identity as a CIA operative. I would warn the Nashville Bun Company to be very careful with this kind of approach because you can't keep making buns if the Democrats take all your dough. Hey, you take the positives wherever and whenever you can get 'em. View from the cheap elite seats! My good friend Dave scored a couple of tickets to see the Twins take on the Detroit Tigers last evening. In my almost thirty years as a Twins fan, these were by far the best seats I’ve ever had. We were two rows back above the first base dugout. These weren’t just any seats mind you. These were the club level dugout seats where a waitress comes to take your order! In going with my customary nitrate stick Dome Dog and Diet Coke, the waitress brought it to me personally as opposed to handing it to someone on the aisle seat and having them pass it on down. She even opened my 20 oz. bottle of Diet Coke and placed it in the cup holder in front of me. Now that’s the way to enjoy a ball game!! Alas, the Twins turned in yet another frustrating performance in a 3-2 loss. While I was disappointed in the outcome, I enjoyed filming some up-close video clips of the action. Johan Santana gets Ryan Raburn to fly out to right field for the first out of the game. Santana ends the first inning by getting Gary Sheffield to ground out to shortstop. Pat Neshek’s stellar relief effort continues with a strikeout of Magglio Ordonez. I had a great second interview yesterday with a Twin Cities manufacturing company. The initial phone interview took place on Monday and then I was called back right away to come in to meet with the Accounting Manager and the HR generalist on Wednesday. The whole process started at 3:00 and I was done by 4:30. I’ll find out Monday the 23rd if I’m in line for a third interview. As I got in my car to go home I saw I had a voice mail message on my cell phone. Hey Brad, it’s “Hagzilla” (my boss, but not her real name). I just wanted to let you know that you don’t have to come in tomorrow. I talked to “Tortoise Lady” (my replacement, but not her real name) and she didn’t feel as though she was benefiting from you being here so we’ll go ahead and release you now. I’ll pay you on Friday for your two weeks worked and then still go ahead and pay your severance. Good luck to you (Sound of her slamming the phone down). Apparently, Hagzilla was a bit irritated that I ducked out at 2:30 yesterday afternoon to go to my job interview. Huh. I guess I didn’t realize that it was improper etiquette to actually search for gainful employment after having been fired placed on “Transition Employment.” As it turned out, I got no latitude despite having worked an average of two Saturdays per month while employed by that company. Oh well, I can’t be too upset. After all, if you’re reading this on Thursday, July 19 before 10 am, it’s a good bet I’m still in REM sleep. Day one of nine is in the books! Today began “Transition Employment” with my current employer. After firing me separating employment, my employer offered me the opportunity to stay with the company through July 27 and collect some severance. If I declined, then today would have been day one of unemployment. I honestly wrestled with the decision of whether or not to go back. Truth be told, I’d rather defecate a flaming hot porcupine than to work there another day (My apologies for the unwanted visual). But my motto for every noble duty these days is “It’s for our baby.” We are still progressing with our adoption plans, so any extra cash is welcome at this point. The good news is I have a two-hour interview scheduled tomorrow with a well-established Twin Cities company. I had an initial phone interview yesterday and then I received a call this afternoon asking me to meet with the Human Resources director as well as Corporate Accounting Manager. It looks promising! But I still wouldn’t be opposed to taking off the month of August should I not find gainful employment within the next two weeks. Keegan’s Irish Pub was the place to be Saturday evening! 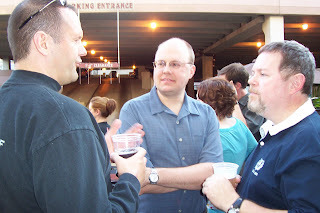 The annual Summer gathering of the Minnesota Organization of Bloggers took place and, as always, it was a great opportunity to renew acquaintances with fellow MOB-sters as well as meet many others for the first time. 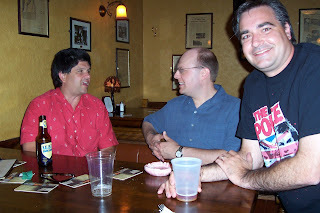 Here I am intently listening to the pearls of wisdom emitted by Derek Brigham (left) of Freedom Dogs and John “Night Writer” Stewart. Ben Worley (left, of Hammerswing75) has been a regular commenter of mine for quite a while yet I never met him in person until last evening. It was quite an honor!! 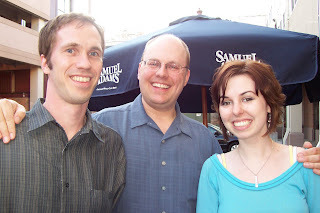 I was also privileged to finally meet the Mall Diva (right), valued contributor to the family-run Night Writer blog. 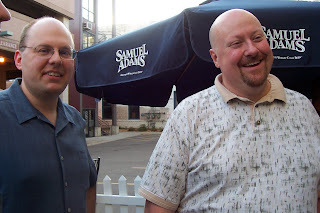 A photo-op with Dan “Northern Alliance Wannabe” Stover. Dan was pulling double duty on this night as he was busy socializing in addition to babysitting his daughters (ages 6 & 5). 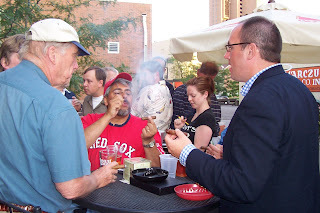 Here, King Banaian (in Red Sox shirt) and the DFL’s public enemy #1 Michael Brodkorb (right) enjoy cigars while basking in the glory of another stellar show on AM 1280 The Patriot. Here I’m chatting with AM 1500’s Bob Davis while Learned Foot (right) of The Kool Aid Report (a/k/a “Power Line on meth”) mugs for the camera. 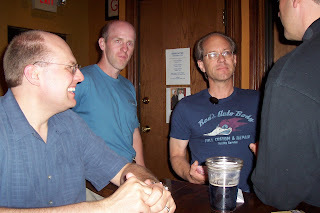 James Lileks (right, wearing glasses) graces us with his presence. Of what little I read of the Star Tribune, Lileks’ column was one of the few worthy indulgences. He still does blogging, which always provides a nice dose of entertaining reading. -The gregarious Mitch Berg, AM 1280 radio guy and blogger extraordinaire. You can always catch him talking impassionedly as ever about reviving his beloved St Paul by getting more Republicans on the school board, city council, etc. -Speed Gibson, who has lost a total of 75 lbs over the past few years and it still going strong! -John Wilson, who himself took plenty of photos of the soiree. -Andy Aplikowski, mayor of the MOB and an incredibly generous individual (first time I ever met the guy and he buys me a drink!!). -John of Roosh Five, who offered a kind word of encouragement after my recent job loss. As always, I look forward to the next big endeavor!!! It has been a rather challenging week, to say the least. Then I find out yesterday that I am being let go from my job. For some reason, companies these days don’t just come out and do the Donald Trump bit of “You’re Fired.” No, instead I’m being offered what is called “Transition Employment.” I’ve heard other asinine labels such as “Outplacement Program” or “Reorganization Efforts”. But “Transition Employment”? As I read through the Separation Agreement (another vapid phrase, IMO), I found out that Transition Employment entails me transferring the knowledge of my current responsibilities for the transition period of July 17 thru July 27 (nine working days). Showing that I was taking it all in stride, I asked my boss “What’ll we do the other eight days?” Being the hard-nosed, stuffy VP that she is, that didn’t go over particularly well. Basically, I still have two full paychecks coming for the actual work I’ve done (and will do) and then I will receive an additional two weeks severance. Based on my calculations, I could be out of work until the end of August and live strictly on my paychecks and severance. A wise man once said, “Out of every adversity is a seed of equal or greater benefit.” God is still Lord of my life. Because of that fact, I don’t stress on iota over the uncertainty of my family or my employment situation. After all, we are bound to reap a bountiful harvest of benefits after the tumultuous week we have endured. I know. “What on earth does a 5 lb. 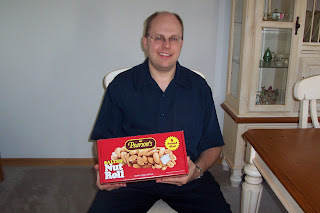 Nut Roll look like?” you may ask. 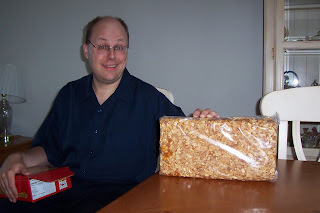 It serves the equivalent of 54 regular size candy bars!!!! At 200 calories a serving, that’s a whopping 10,800 calories!!! If the Twins are to return to the postseason this year, they are going to need a similar post-All Star game run to 2006. After a scorching month of June last year, the Twins entered the All Star break at 47-39. Their 49-27 record after that won them the division. This year, the Twins are a mediocre 45-43. I surmise they have to finish 48-26 just to get in the playoffs. While I don’t envision them catching the Detroit Tigers in the AL Central, I think 93 victories would put them in the 2007 postseason as the AL wild card team. Now, can they get there? -Trade for another hitter. Nick Punto CAN NOT be the everyday third baseman. While he is one of the better fielding infielders on this club, he is barely above the Mendoza line at the plate. In the American League, that’s a killer if you have a sure out in your lineup. A trade for Tampa Bay Devil Rays infielder Ty Wigginton could give this team a pretty good bat at the bottom of the order. With a .269 average, 13 homers and 42 RBIs at the break, it’s a significant upgrade over Punto’s lifeless bat. Plus you free up Punto to be the utility infielder, a role where he would be most valuable to this club. He could occasionally spell Luis Castillo at second base and Jason Bartlett at shortstop, both of whom wore down at the end of last year due to playing practically every day. -The Twins need a pitcher to step up and be the #2 starter. We know Johan Santana will be Mr. Reliable as he normally is after the All Star break. From 2003-06 Santana is a ridiculous 40-4 in post-All Star break starts! Having won four in a row just prior to the break, Santana is already primed for yet another great second half. Last year, the Twins had a solid #2 guy in Francisco Liriano until he went on the shelf in early August. Then Brad Radke stepped in with several gutsy performances until his bum shoulder gave out in September. Thankfully, Boof Bonser was up to the task when Radke went down. Boof had several good starts down the stretch which helped the Twins ultimately pass the Tigers in the division race. This season, the Twins have gotten some solid starts from Scott Baker, Carlos Silva and Bonser. They have also been equally miserable at times (see the Chicago White Sox series, July 6-8). That leaves Matt Garza, who pitched six shutout innings last Friday at Chicago. Is it realistic to expect a 23-year old with only a handful of major league starts to step up to #2? Considering the alternatives, it may be our best hope. The Twins have a ten game home stand starting tomorrow with a game against the Oakland Athletics. With four games against the A’s, three with the Tigers and three more with the LA Angels, we’ll know at the end of this stretch of games just how serious of a contender they will be. Separated at Birth: Bela Lugosi & Al Gore. With Al Gore (right) going with the slicked back hair, he bears an uncanny resemblance to actor Bela Lugosi, who is most famous for having played Count Dracula in the 1930s. Sports Einstein of the week: Darren "Doogie" Wolfson. He occasionally fills in at the sports desk at Fox 9. I have commented on this site that he looks totally out of place as a TV personality. I would think if the powers-that-be at KMSP allow this guy to do sports you would hope they require a little knowledge of sports history. While recently having baseball Hall of Famer Paul Molitor on his TV show, the sportscaster kept referring to Molitor’s former team the Milwaukee Brewers and this year being the 25th anniversary of their National League championship club. So my “Sports Einstein of the week” this week goes to KFAN’s Darren “Doogie” Wolfson. It’s true that the Milwaukee Brewers are in the National League…..but only since 1998. Back in 1982 the Brew Crew won the pennant in the American League. Celebrating 7 years on 07/07/07. Sevens are wild on this date. My gal and I celebrate 7 years of wedded bliss here on 07/07/07!!! I entered in my URL to determine my blog rating. I must say, I'm somewhat surprised. Given some of the visitor comments on this blog (posted and unposted), I was beginning to think some people thought I was the anti-Christ. I was tagged by Marty Andrade to put together a book meme. Joel Osteen’s “Your Best Life Now! !” I actually wrote about the impact it had in helping me overcome an unwanted family trait. “How to Win Friends and Influence People.” I found that in my early to mid 20s I had a rather repellant personality. Today, the Dale Carnegie classic still impacts me in that I am much more cognizant of what I say to others in conversation. The Bible. Hey, it’s been my survival guide for over 20 years. Seems to me a deserted island would be the ultimate test of one’s faith and spiritual strength. Plus I would need to cling to the belief that one person could feed hundreds with a few loaves and fishes. Ann Coulter’s “Godless: The church of liberalism.” With her patented acerbic wit as well as thorough analysis, Ann eviscerates certain sanctimonious libs and the creeds of their own religion called "liberalism". “Let’s Roll” written by Lisa Beamer, widow of United 93 passenger/hero Todd Beamer. Her heart-wrenching account of learning about Todd’s demise on 9/11/01 and her heart-warming faith in dealing with the tragedy caused me to reach for the Kleenex. KFAN’s (and former Star Tribune columnist) Dan Barreiro has told so many bizarre tales about the Minnesota Timberwolves (pre-Garnett) that I would love to see them all in print. “My Lie Life”, the autobiography of former President Bill Clinton. Because he is such a narcissist, the book is over 1,000 pages long. Goodness gracious, think of the serious back injuries that resulted from trying to remove it from book shelves. A couple, actually. Always reading through The Bible. I am also reading a book entitled “Overcoming Rejection Will Make You Rich” by Larry DiAngi. "Original Intent" by David Barton. I purchased this book a few years ago but for some odd reason I just didn't get into it. Barton not only documents the original intent on a number of constitutional issues debated today, the book also documents how this essential information is often ignored under today’s standard of political correctness.